On September 14, the Faculty of Science celebrated a $500,000 gift from the Carswell Family Foundation towards a new one-metre custom telescope and the naming of the Allan I. Carswell Astronomical Observatory (or Carswell Observatory, for short). 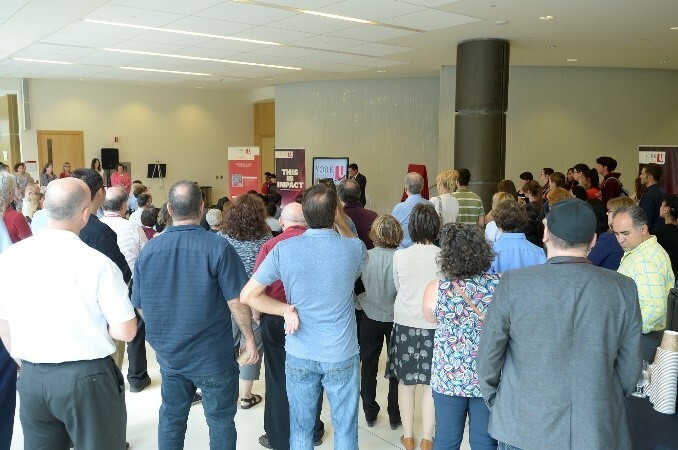 The gift was matched by York University and the Faculty for a total investment of $1 million. CBC News and CBC TV covered the announcement. Alumnus Nigel Lockyer was reappointed as the Director of the U.S. Department of Energy’s Fermi National Accelerator Laboratory. Staff member Nina Bui has been selected to be on the Canadian National Women’s Rugby team for the World Cup in November. Former PhD student Vera Fischer (Mathematics & Statistics) was awarded a prestigious START grant from the Austrian Science Fund. 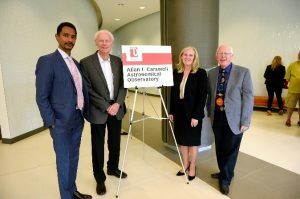 Tanya Da Sylva (Division of Natural Science, Biology), and Michael De Robertis and Paul Delaney (Physics & Astronomy) received eCampus Ontario grants for their online initiatives. PhD student Nadia Tsvetkov (Biology) received the President’s Prize for the best oral presentation at the Entomological Society of Ontario Conference and AGM. Our new faculty members Thomas Baumgartner (Chemistry), Cora Young (Chemistry), Chris Caputo (Chemistry), Ryan Hili (Chemistry), Derek Jackson (Chemistry), Nicole Nivillac (Biology) and Steven Connor (Biology) were featured yFile. Research by Kathi Hudak (Biology) and her PhD students Kira Neller and Alexander Klenov on virus resistance in plants was featured in the research edition of yFile, Brainstorm. Seyed Moghadas’s (Mathematics & Statistics) newly acquired computer cluster was featured in yFile. Amro Zayed (Biology), Laurence Packer (Biology) and their teams published Queens and Workers Contribute Differently to Adaptive Evolution in Bumble Bees and Honey Bees in Genome Biology and Evolution. Daniela Monaldi’s (Division of Natural Science) study of Fritz London’s seminal idea of “quantum mechanisms of macroscopic scale” was highlighted in a News & Views article in Nature Physics. Thomas Baumgartner’s (Chemistry) research was mentioned in a recent article in Chemical & Engineering News. Roberto Quinlan (Biology) presented “Searching Lake Mud for Clues About Human Impact on Lakes” at the Toronto Public Library. Research by Master’s student Fargol Nowghani (Biology) on mayfly biology was featured in yFile. Professor Emeritus Diethard Bohme (Chemistry) published a trilogy of articles in the International Journal of Mass Spectrometry that revealed relativistic effects in chemistry. His research team systematically measured the rates of formation of chemical bonds between molecules and atomic transition metal cations in order of increasing mass. Higher rates were observed for the heavier atomic ions going down the periodic table, as predicted by theory. Tom Salisbury, Peter Gibson and Huaxiong Huang (Mathematics & Statistics) were featured in a Globe & Mail article about the Fields Institute’s summer research program. PhD student Nadia Tsvetkov (Biology) spoke to Reuters TV about her research on the negative effects of neonicotinoids on bees. Dean Ray Jayawardhana authored “The Ansel Adams of Outer Space: A Scientific Mission to Saturn Produces Aesthetic Dividends” in the Wall Street Journal. He also spoke to CBC News about the end of the Cassini mission. Paul Delaney (Physics & Astronomy) spoke to CTV News, AM640, Global TV, SiriusXM, and Rock 95FM about Cassini’s demise, as well as to CTV News, Global TV, CHML and SiriusXM about the lunar space station, Elon Musk and the HI-SEAS Mars simulation mission. Dawn Bazely (Biology) and her students were featured by PTV News in a segment about the upcoming India Canada Symposium at York University. Oct 25: York Gairdner Lecture: “Natural products as probes of the pain pathway: from physiology to atomic structure,” presented by Dr. David Julius. 1:30-2:30 Senate Chamber, N940 Ross, Keele campus. Nov 7: York University Retirees Association YURA Showcase, at Central Square 9:00 am to 3:00 pm. The event will include sales of re-giftable items and baked goods. All proceeds will go towards supporting needy graduate students.